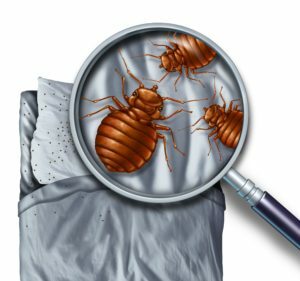 Bed bugs are a nuisance that are becoming more and more common. They are skilled hitchhikers that can easily be carried by travel, guests, or used furniture. Bed bugs are commonly found in harborage areas in or near beds or couches. What happens if a bed bug bites? Bed bugs can cause a number of health effects including skin rashes and allergic symptoms. The bite looks like a small red dot, and there are likely multiple bites. Once inside, bed bugs are extremely difficult to remove without the help of a professional. Eastland offers solutions to defeat bed bugs by treating mattresses, box springs, and certain portions of your carpet. We also inspect and treat furniture, floors, and any other harborage areas bed bugs like to hide.